Back in December, Donna had a choice to make. After 38 years in the business, 14 of them with Westminster Savings Credit Union, she had the opportunity to cash out her pension and walk away. She chose not to do that. Several weeks later, she finds herself walking the picket line to preserve the very same pension plan. She has no regrets, and neither do any of her fellow colleagues who are walking the picket line beside her. Typically when a group of workers are driven to the point where they feel the need to go on strike, they’re fighting for something that has an immediate, personal impact on them. That’s what makes Donna, and the rest of the group currently on strike at Westminster Savings Credit Union’s Shaughnessy Station branch, so unique. They’re fighting to save a pension plan not for themselves, but for their potential future colleagues. It wouldn’t be the first time that they’ve saved the pension plan for employees at this credit union, but to understand that a little background is required. 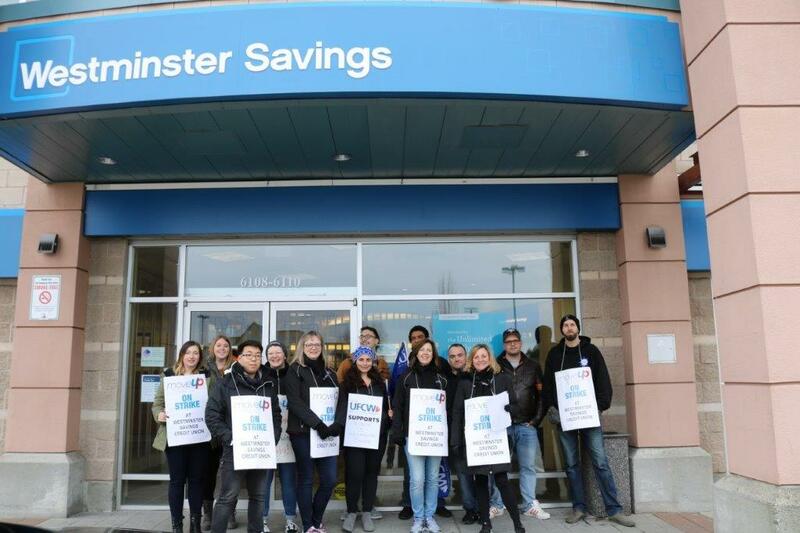 The Shaughnessy Station branch is the lone unionized branch of Westminster Savings Credit Union and the workers there have been without a collective agreement since the previous one expired at the end of December 2016. Among other things, that means our union’s members wages have been stagnant since then. The most contentious negotiating issue has been about the defined benefit pension plan. The employer had initially tabled a proposal that would have moved all union employees from their existing defined benefit plan to a riskier defined contribution plan. Had our union not rejected that initial proposal, it’s safe to say the defined pension plan would be long gone at this point. The employer’s latest proposal involved creating different classes of employees – the haves and the have nots. We labelled it “two-tiering.” They proposed allowing all employees hired before July 1, 2018 to retain the defined benefit pension plan but all those that come after to be on the defined contribution plan. It was a proposal our members knew was meant to placate them but was far more wicked than it appeared. The change was instituted across all the non-unionized branches effective July 1, 2018. Pietro, in particular, can imagine what two-tiering would have looked like. Had this change been instituted just two years earlier before he joined the company, he would have fell victim to the two-tiering with his only mistake being he joined the company too late. But if no one at this branch is affected by the pension change, why did they collectively vote to go on strike? In one word: Fairness. “It’s very important to me that future and young workers have the same pension plan as I do and not an inferior plan,” said Leanne, also a long-time employee of the credit union. “I believe in the new workforce coming in and that’s really important to my values. What irks the members, especially, is that while Westminster Savings has indicated they aren’t willing to budge on this two-tier proposal, they’ve ensured that newly-hired executive managers are exempt meaning that they will still have access to the superior pension plan even if they are hired after July 1, 2018. At the end of the day, our MoveUP members just want to go back to work so they can serve the credit union’s members whom they have built great relationships with over the years. Our members are grateful that the credit union’s members have shown tremendous support so far on the picket line even if it has caused them great inconvenience not being able to conduct their business at their local branch.